If all else fails, 2006. Twenty-three-year-old Daniel Domig is a natural fit for this young exhibition space, which opened less than a year ago on the third floor of a building on the Bowery. For his debut solo show, the Canadian-born, Vienna-based artist brings together a new series of paintings that explore the concept of shelter. Domig’s canvases feature visions of dwellings, doorways, and windows suspended in moments between reality and illusion. His palette, rich with gloomy, smoky tones lit by brushstrokes of vivid color, recalls Neo Rauch’s contrasting of dark atmosphere and hints of bright hues, while the composition, comprising multiple perspectives on the same plane, is reminiscent of Pop’s juxtaposition of heterogeneous images. 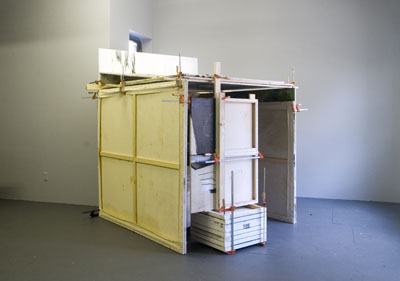 Domig takes his practice further, exploring relationships between painting and sculpture: In the middle of the room stands If all else fails, 2006, a structure built using twenty-two of his paintings, held together by clamps. Both sides of the canvases are visible, showing both the pictorial representation and its frame. Within this makeshift construction, an armchair offers a site from which to contemplate Domig’s intimate pictures, as well as a small monitor endlessly looping a procession of his visionary imagery. It’s an elaborate walk-in painting, an immersive environment that evokes the fragility and claustrophobia of a temporary shelter.